Man 1: We are most happy to announce that Pete Maravich will play professional basketball for the Atlanta. Jaeson: I knew he was a player, but I didn’t know to extent of, you know just, of Pistol Pete, who he was, how good he was until I just had people come out in droves and just tell us, you know, your dad is one of the best players ever to pick up a basketball. Man 2: You’re looking at Pistol Pete Maravich, in my opinion, the greatest playmaker playing today. Josh: Going in the attic you know these past couple years and reading article after article and how big he was and still is. Pete: I like to thank also my wife and my two boys that are here tonight Jaeson and Joshua, my wife Jackie. They mean so much to me. Jackie: I remember he used to tell me, he said, “You know, when I die, you know, people will forget about me after a couple of weeks,” and he’s more alive today than he ever has been. Jim: Watch him for a moment and then try to conjure the right word. While you watch, remember what you’re seeing happened more than a quarter century ago when such… What’s the right word? Magic? When such magic was usually found only in the confines of the barnstorming Globetrotters his name was Pete Maravich, forever known simply, grandly as Pistol. 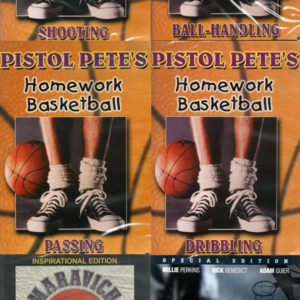 I had the privilege of covering Pistol during his early days in the NBA long before there was any instant replay in the arenas. And every game there was at least one moment when those of us on press well would look at each other and say, “What in the world did we just see?” And often the other players on the court were saying exactly the same thing. Magic Johnson: Boy could he play basketball and could he entertain you, you know, the no look passes, the dribbling the ball and them pat it with one hand. 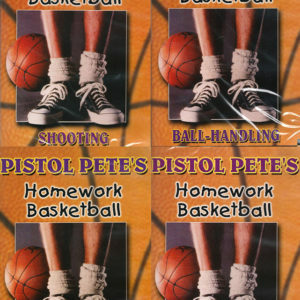 That’s where I saw that from Pistol Pete. That’s where I got it from. Bob: It was like the ball was like an extension of him. He could shoot it from deep. He could take it, and he could wrap it around. I mean, he was doing stuff that you never saw. And you know, and you never see a white boy doing on top of that. This is a white boy I’m talking about. This ain’t a brother, but he must’ve had some brother in him because he was dazzling. Spencer: Pete was doing a lot of things that was…that had us all sitting around saying, “Wow, man, look at that! Whoa, did you see that pass? Did you see that move? Did you see this?” And so we were all just sitting there in amazement. Pete: The things that I did with the basketball down a back pass, between legs, and things of that nature, I played for the fans. There was no doubt about that, but sometimes my teammates didn’t enjoy it because I hit a lot of them in the face. Jim: Nothing much worked, and he was traded to the expansion New Orleans Jazz for two years’ worth of draft choices back in the shadows of the French Quarter where he’d made his collegiate headlines. The victories were a few, but the crowds were once again enormous. Man 3: And the crowd is going wild here at the Super Dome. 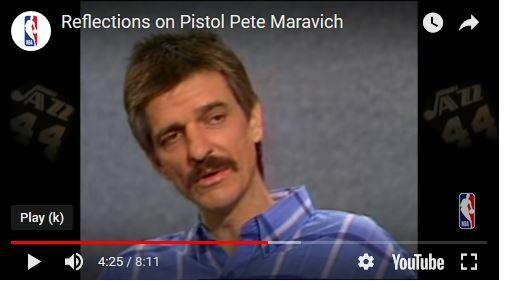 Jim: Though he adored the spotlight, Pete Maravich was a quiet, sad man who for years, decades had been desperate for some meaning to his life. Pete: Why I’m here and what’s the purpose of this life, basically, led me through a lot of different stages from different religions and Hinduism, reincarnation, to hypnosis, astral projection, UFOs, Ufology. I went all those different looking for peace. Jim: Jackie Elliser Maravich, a blind date who became his wife and the mother of his two sons rode that emotional roller coaster with him. Jackie: I think he was searching for happiness. All the different things he went through, I mean, he loved the game but I think it became a burden to him. Jim: Though his roots were in western Pennsylvania and the Carolinas, his playing career took him across America. It was Pete’s ties to Louisiana that were his true lifeline. He set records here that may never ever be broken again. He made his final home here, and he met and married the love of his life here. A life that came to an end far, far too early. 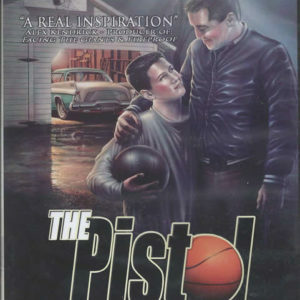 Dan: An America original died today, Pistol Pete Maravich. He was a college basketball’s all-time scoring champion and later a professional star. Jim: On a January morning in 1998, during a pickup basketball game at a church in California, Maravich collapsed and died of a broken heart. He was just 40 and in the dawning stages of a dramatic, fulfilling rebirth, life suddenly had a purpose. Jackie: When he found his Christianity is when he found true happiness. Jim: And you saw a huge change in him at that point. Was it just like overnight? Jackie: I saw a difference in him and I thought it was just another phase he was going through, but he had a peacefulness about him. He just really changed a lot of people’s lives after that because of, you know, the type of person he had become. Pete: My life has changed so dramatically that nothing, not a thousand NBA championships, not a thousand Hall of Fame rings, not one hundred billion dollars would I trade for my position where I am right now. Jim: Jaeson and Josh where were just small children when their father died. Only in the decade since have they discovered what he had really been all about. And that as much as anything leaves them clinging today to video, pictures, word of mouth, any reminders. Are you surprised that he’s almost larger in death now than he was in life? Jaeson: He was so far ahead of his time that the way they play today is almost a mirror image of what he did. And there’s still some things he’s done that I haven’t seen people do today, so it doesn’t surprise me that he’s bigger than he was. I think him playing today would be the perfect…I think he’d be the most popular player in the NBA and one of the best. Jim: There was much we never knew about Pete Maravich those precious few years we had him. But more than any one thing, it was what killed him that stunned us most. He was born, lived, and played so ferociously all those seasons with a badly damaged heart. He never should have lived past his teens. That he died at 40 shocked us all. That he made it that far doing everything to a remarkable extreme should be the real surprise. But watch again for this is the gift he left us with. Have you found the right word yet?